Letter to Mary Johnson of Worthington, Ohio from Charles Stickney of Republic, Ohio is text, with genre letter and correspondence. Its dimensions are 11 in. x 8.5 in.. It was created on Wednesday, September 8, 1841. This letter was written to Mary Johnson of Worthington, Ohio from Charles Stickney of Republic, Ohio. It is a second appeal from a hopeful suitor to begin a correspondence with her. 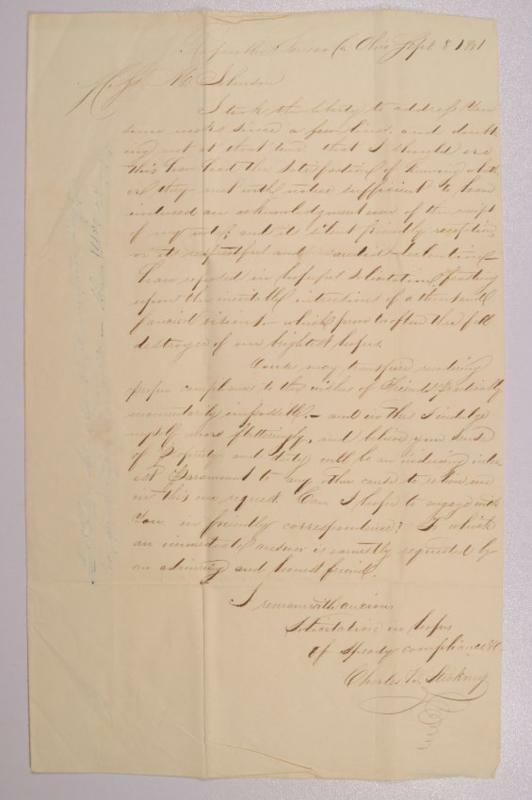 He begins this letter by mentioning that an earlier letter he sent her was unanswered and questions whether it was even received, if it was received with displeasure and therefore ignored, or if she has been too busy to respond. He then goes on request they begin a correspondence again and asks that she reply soon. Charles Stickney had met Mary and her father, Orange, while on a coach returning from a trip they had taken to the east. It features the people Charles B. Stickney and Mary Sessions (née Johnson), 1823-1919. The Worthington Historical Society identification code is 2012.0005.117. The Worthington Memory identification code is whs1005. This metadata record was human prepared by Worthington Libraries on September 7, 2017. It was last updated October 13, 2017.